Simplified Chess removes thousands of years of patchwork rules from what is at essence a very simple game. By making seven minor rule changes, the game becomes infinitely easier to teach but loses nothing in terms of depth of play. The fact that there are no studied openings (as of this writing) means that even very well studied FIDE chess players will be on equal tactical and strategic footing with more spontaneous players. Removing rules to make a game better is nothing new. I hope you find the rules I've removed to have resulted in a better game. The board is like the standard 8x8 FIDE Chess board. The exception is that the last row is removed. This leaves a 7x8 board, with all the Black pieces moved forward one space. 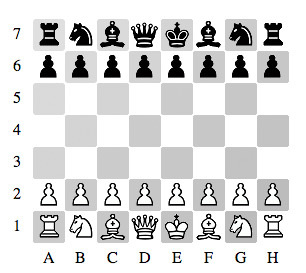 Note that this will result in the Kings both being on Black squares. There are no other special set up considerations. You only need the standard FIDE Chess 32 piece set. You do *not* need extra pieces for promotions. There are seven rules. (or removal of rules...) Actually there are seven rules removed from FIDE Chess. 1. There is one less row. The board is 7x8 2. There is no check/check mate. You win by King capture. 3. There are no Draws. 4. There is no double move for pawns. Pawns will always move one space. There is no en-passant. 5. There is no castling. 6. A pawn may only promote to a captured piece [QRNB] and not move to the last row unless there is a piece to promote to. 7. If a player can only legally move his King or can not legally move any pieces (a very rare situation), then he loses. The rules for this variant are so simple you can teach it to children without having to resort to removing all kinds of rules ... wait ... I already did that. It will also appeal to standard players because of its unique configuration and combative style. There is a very unique feel to the game that seasons players will appreciate. Of the rules that were cut from FIDE, I attempted to examine the ones that created the most bizarre moves. For example the pawn is the most complicated piece in the game with the following rules applied: " 1. The pawn may move forward to the unoccupied square immediately in front of it on the same file, or 2. on its first move the pawn may move as in (a); alternatively it may advance two squares along the same file provided both squares are unoccupied, or 3. the pawn may move to a square occupied by an opponent`s piece, which is diagonally in front of it on an adjacent file, capturing that piece. 4. Ad. A pawn attacking a square crossed by an opponent`s pawn which has advanced two squares in one move from its original square may capture this opponent`s pawn as though the latter had been moved only one square. This capture is only legal on the move following this advance and is called an `en passant` capture. 5. When a pawn reaches the rank furthest from its starting position it must be exchanged as part of the same move for a new queen, rook, bishop or knight of the same colour. The player`s choice is not restricted to pieces that have been captured previously. This exchange of a pawn for another piece is called `promotion` and the effect of the new piece is immediate. " Phew! All this for what is considered the lowest value piece in the game. My first experiment with this was to simply remove the rules above on an 6x8 board, but this ended disastrously. The Bishops were aimed directly at the Rooks and every pawn move was an immediate attack. Then I did the unthinkable. I made an odd number of rows. It had a strange effect on the way the game was played. With a middle row, there was a friction to the middle of the board that isn't there in FIDE Chess and which feels deceptively easy but then pulls on you. That middle space is both no-man's land and vital ground and the fight for it is at the end the fight for the game. Hello John. I think the basics here are that I posted Skirmish Chess, not knowing what it was, and you suggested chopping the last rows off and removing a lot of rules. I happened to keep the rows in actually. You then went this chopped route, playtested it, and decided to throw a row back in. I feel it is more like you worked on Near Chess, while Simplified Chess is your own thing. My take on Simplified is that I would put castling in if I were to play it, and put more of a focus on the distance between the pieces (and single pawn movement) instead of it being simplified. What I will say, out of all this, is the 8x7 board is what has seemed to have captured the most interest of people though. David Paulowich, I've taken on what you've said and added the addendum that if a side can't legally move that they lose. I very much appreciate your interest in this variant and your continue detailed review. Please note that Rich is working on various other version of Simplified Chess that I am not involved with. He liked the idea and ran with it. My goals are and continue to be to create a set of rules for chess that are as simple as possible while retaining the basic feeling of chess. I know that pieces, as you've shown, can become blockaded, but this position is almost a position that requires the player blockaded to purposely place his pieces in this manner. It's so rare and extremely unlikely that I doubt it's come up in 99.9% of games. However you are right that games should not have leaks and holes in them. In attempting to simplify, there was his gap. If you see more problems please post them. Also, I would VERY much like to see a game report from you. 'Actually there are seven rules removed from FIDE Chess. 2. There is no check/check mate. You win by King capture. 3. There are no Draws. 4. There is no double move for pawns. Pawns will always move one space. 5. There is no castling. last row unless there is a piece to promote to. IF A PLAYER CANNOT LEGALLY MOVE HIS KING, Rule 7 does not apply! IF A PLAYER CANNOT LEGALLY MOVE HIS KING, Rule 7 does not apply!! IF A PLAYER CANNOT LEGALLY MOVE HIS KING, Rule 7 does not apply!!! lose for the side that can not move. See rule 7's last sentence. I'll add examples, it's a good idea. That was, I assume, John Lewis replying to my [2008-05-08] comment. Statements like that will not impress anyone who actually understands the English language. I 'played' games of Shatranj in 2005, posted [2005-03-08] on the Shatranj Comments/Ratings page, and FIDE Chess in 2008, both ending with the King (belonging to the player whose turn it was) stuck in a corner, surrounded by friendly pieces, which in turn are completely blocked by Pawns (friendly and unfriendly). John Lewis and Rich Hutnik (see his 2008-05-09 comment on this page) continue to pretend that those games do not exist and ignore the lessons they teach. Preset for Near Chess is on here now at: /play/pbm/play.php?game%3DSimplified+Chess%26settings%3DNC1 Mr. Lewis, consider getting that link into the description above.